Visit Gosch Toyota To See The New 2019 Toyota C-HR Today! Gosch Toyota is a new and used dealership that invites our Menifee, California neighbors to our convenient Hemet location to explore all that the 2019 Toyota C-HR has to offer! Our Toyota sales department can introduce you to all the impressive trim options that are available, getting you behind the wheel for test drives on those that complement your search requirements, so don't hesitate to contact us today! To get a feel for all the assistance we offer, browse our website before visiting Gosch Toyota for a customized C-HR experience. 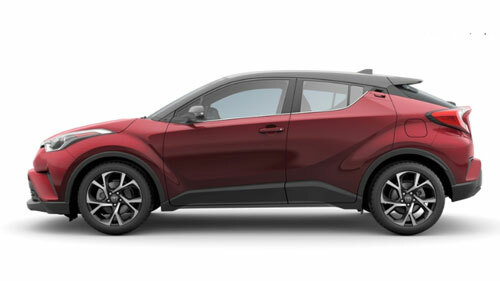 The base XLE trim model of the 2019 Toyota C-HR features vortex-styled 18-inch Sport alloy wheels, a rear spoiler and a 7-inch touch-screen display so that drivers can get the most out of every mile they drive. Step up to the XLE Premium model to enjoy integrated fog lights, a Smart Key System and puddle lights with an innovative "Toyota C-HR" projection. Our new and used Toyota dealership that serves Murrieta, CA has an on-site finance department that will cater to your loan needs, so don't hesitate to send our team a credit application via our website before visiting us to learn more about the C-HR family! From its Push Button Start system to its Electric Parking Brake with Brake Hold, the 2019 Toyota C-HR is a force to be reckoned with! Explore the Multi-Information Display for yourself and see the auto-folding outside mirrors in action, visit Gosch Toyota near Menifee, CA now! Our Toyota sales department will gladly review all the technology features that the C-HR boasts, as well as those that are available to add onto your purchase. Don't miss your chance to obtain a quality vehicle that you can rely on, visit Gosch Toyota to secure a 2019 Toyota C-HR! Talk to our finance professionals about your loan options and be sure to come back and see the factory trained technicians in our service department when it's time for a competitively priced oil change!